I can't help myself at this time of year. I feel cooped up and always start attacking my home in an effort to brighten up for spring. My living room was the target this weekend. I've had the art piece below (giant chess knight) for years. LOVE him. I moved him and the painting above from another room. The painting is coincidentally called 'All Is Bright' and was actually used in this Sarah Richardson Design show installation here. 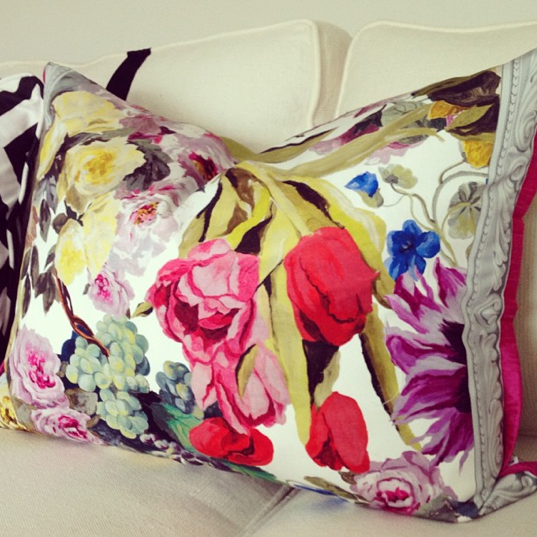 Gorgeous pillow! The chess piece is super fun as well. I love the pop of yellow, it says spring to me! That is an amazing art piece. I liked that you placed it on the floor, most people probably would have put it on top of something. 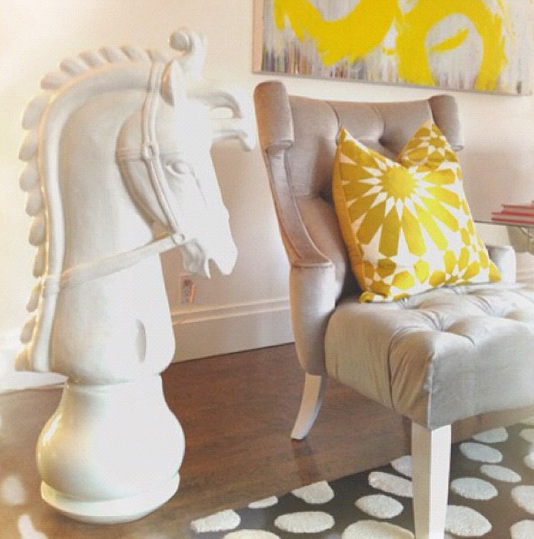 Loving the chess piece, and the pillows are oh so fun! Love yellow and grey combo! The room looks, as intended, bright and happy. I just finished reading the Hunger Game book so can now enjoy the movie. Glad you recommend it! Looks beautiful! I can see a sneak peek of that Homesense rug you scored! loving the yellow and grey scheme and of course that black and white polka dot beauty!! can't wait to see the entire room! Love the white knight as well!! love these! I wish Sarah Richardson was my bff. love your blog! I am really loving that pillow with such a watercolor painterly feel.... ahhh!! Holy Christsticks...I'm IN LOVE with that horse- like obsessed/jealous/lusting after...not enough expletives...ADORE HIM! And don't get me started on the Orangie pillow- 100% my dream/favourite ever fabric...you never cease to amaze me!! I love that pillow! As for spring - it does get the energy going doesn't it? I am itching to make changes here as well! Your pillows are killing me! Loving everything you are doing lately!